Message from Xenios: Celebrating a Milestone by Focusing on YOU! I haven’t written to you in two months as August was a bit of a slow month, so a lot has piled up to talk about. First, I want to share some of our internal targets here at PPH and how we are faring against them. We think of our community as an extension to our team so we want to be open about our goals. Big milestone – reaching profitability! Earlier in the year, the Company Board had decided that we should aim to get profitable as a business as soon as possible. We set a target to achieve this by year-end and we are finally very close. It’s not been easy achieving this. Twelve month ago the modus operandi was “manage for growth” i.e. grow as fast as we can and focus on the top line instead of the bottom line. The change in that direction back in January meant we had to make some tough decisions and sacrifices. We downsized our head count, reduced marketing spend and cut fat across the entire operation to make it slimmer and leaner. Painful as it was, it’s been for the better. Our business is now leaner and more focused, we move faster than ever as we have less moving parts, less management overhead and less things to worry about. And we are now finally financially independent, which means we can take the time to think through things properly and not jump into things under the pressure of bleeding cash. Most importantly, whilst sadly this meant a lot of departures by some really good people who really showed extraordinary commitment to the company over the years (for which I am immensely grateful), the ones that stayed behind are more bonded together as a result, more bought into the next phase of PPH and more focused. Everyone has made sacrifices, everyone has more skin in the game and is more committed to the cause of serving YOU – our users. Going for a tighter, saner target per se also forced us to get real about a lot of things. We collected more user feedback in the past two months than we did in the past two years! We also got serious about fixing a lot of the lingering things. This is not to say we were not serious about things before but we had a lot of ‘growth related’ chapters open as that was the focus, like referral schemes, affiliate schemes and things to improve traffic and conversions. In the past three months I emailed over 10,000 of our users and had one to one conversations on email or phone with a good 1,000 of you. I got great insight by doing that -invaluable in fact. It reminded me of the early days of setting up the business when that’s all I did. I’ve vowed to never defocus from doing this in the future however large we get. It’s the best use of any CEO’s time. In fact I am shocked at how many people’s opening response is “Wow I’ve never had an email from the CEO of a company before…” and a lot of users inferred that it wasn’t me. I assure you: that email came from my inbox as you will know if you responded, because I personally responded back to anyone who answered. And flattering as your response may be, it just shows me how little focus on customers other CEOs place, which is music to my ears. What else is there to focus on when it all begins with the customer? Anyone who wants to have a conversation with me, please email me on xeniosth@peopleperhour.com. Many of the things you’ve told me are now locked in the roadmap and will be launched in the coming months. We ditched a lot of the marketing/growth initiatives and focused exclusively on one thing: improving the customer experience. For the Buyer, that means finding quality, reliable freelancers quickly and painlessly and having a smooth interaction with them from start to end. For the Seller, it means helping you be successful, helping you win. We’ve already launched numerous of these features like allowing Sellers to manage their availability for Hourlies, including when they are on holiday, what their working hours are and more, so that they don’t get penalised for slow response to sales or messages. We introduced IP recognition to prevent Sellers in low cost countries pretending to be in the UK and the US, which annoys everyone. We introduced portfolio image reordering to allow you to manage your portfolio easier without having to delete and re-upload. We introduced enhanced spam prevention for the stream and clarification board. And lots more you can read on our blog. Next we are introducing a new version of the inbox, which makes it much easier to manage your work, along with tools to help you collaborate with each other like instant messaging, video conferencing and time tracking, push notifications and full end to end functionality for our mobile apps. Also in the pipeline is a multi-currency wallet so you can transfer funds between currencies, a new and more global payments gateway that will allow you to get paid via many more channels and in many more countries without incurring the current international payments fee. From a discovery point of view, we are planning to introduce an improved ranking algorithm (CERT) that factors in many more behavioral elements like speed of response, dispute rate, refund rate, engagement levels and much more, so that it’s not just about the end result but also about being a reliable, engaging, trusted member of the community. On the Jobs side, coming soon are an enhanced Proposal management tool for Buyers, a more detailed posting form which we tested for one category with great uplift so we are rolling it out across all categories, and a much more accurate recommendation algorithm suggesting highly relevant, high quality Sellers to Buyers who post Jobs. All of these are features that our users asked for. A lot of the solutions, like the new inbox, we have demoed to a number of you and got invaluable feedback. We’d love to get more input for all the features above, so if you’d like to be added to the demo list please email me and write “DEMO” in the subject line to xeniosth@peopleperhour.com. Exactly thirteen months past the nerve-racking launch of Hourlies, they are now our fastest growing product. Each day, there are now exactly twice as many jobs starting with an Hourlie purchase than a Job posting. In my view, one of the hardest things to do with limited resources is finding that balance between fixing problems with your existing products, iterating and optimising, and on the other hand dreaming up your next innovations. We are big believers that companies exist to constantly innovate and serve their customers better and better by doing so. The moment you stop, you just fall down. So whilst the above list is what takes priority right now with a focus on improving the customer experience, we are simultaneously toying with new products, new concepts to better serve more customers. We believe that we are just at the beginning of the freelance economy. 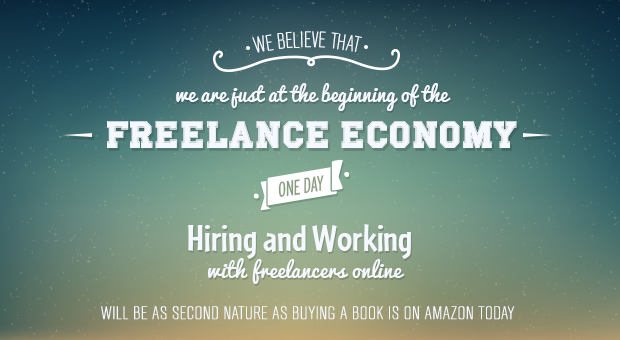 One day hiring and working with freelancers online will be as second nature as buying a book is on Amazon today. We are just at the beginning of the innovation curve, and hungry as ever to create new fascinating things some of which may fail, but others will WOW our customers! I think one of the biggest failures of businesses is to end up with a bunch of ‘me too’ products that don’t differ, even if they make money. Our goal is to create something truly brilliant, truly different that takes people by surprise. We’d love your help and input in this exhilarating process and journey. Other than talking to my customers the thing that truly excites me is playing with new concepts, mockups and ideas. So doing both at the same time is just about as good as it gets! So please feel free to just email me (xeniosth@peopleperhour.com) for a sneak preview at some of the stuff we are cooking up. Or just to say hi, and start a conversation! I always enjoy hearing from PPHers – even when they vent with rage when something went wrong. As I tell my team, low moments are an opportunity; they give us a chance to shine by fixing things for you and helping you getting back on track. Till then – happy PPH-ing. Its a fact that most CEOs consider interacting with end users a waste of time and below their station. In this particular niche, while you do get periodical digests about what the company’s upto, this coming all the way from the top adds a personal touch to it. I just might drop you a ‘hi’ in your mail. the world. Really Love it! We like to get invited on celebration of its events in any time of the year from from each of the country to participate. Hi there Mehede we are in fact working on this, both by improving the Inbox which currently Buyers find a but clunky so this should uplift the proposals awards, but also by providing more reputation stats on buyers. You guys are making it to the top of the industry.I really love the user interface design !!! and ofcourse loving the changes you are making. Creditng the payment to the wallet immeditely after the client paid is a good recent change. But we don’t receive a perfect follow up when a project is disputed. Its really professional and great freelancing site. Thanks Marilyn – we are in fact introducing this ‘new proposal’ feature as it’s been mentioned by quite a few users… its under development now. No problem. Okay – that’s how it *should* work 🙂 So currently a lot end up in the community area because as a user there’s no clear path for us if we’re wanting to report a bug – but on that opening support page you could easily add ‘report a bug/technical issue’ to the three current Help, Community Q&A, and Share your ideas with an easy email us link. That’s all it really needs. I’m sure we’ll still have to refer people on who manage to miss it, but it’ll help! I really like PPH as a platform.I was one of the early adopters of it and have done my every bit to contribute to it .However i think the next target for it to really become a big name would be to focus on markets such as US,Canada and Australia .This will help even us freelancers get bigger projects and also add to the global presence on this platform. I know you guys are already working on it as i see many more projects form these parts of the world. I am impressed with all the recent changes, they’ve gone beyond the usual ‘tart it up’ fluff we see in a lot of places. So it came as no surprise to learn you had been engaging the users for feedback. Keep up the good work. I’m glad things are moving in the right direction for you, hopefully PPH and the freelance community can continue to grow together. BTW – Being able to transfer money between currencies myself would be fantastic, so I can’t wait for that one. indeed, Xenios was come as the best rule of CEO : hearing and heard! Thank you PPH! Xenios, you have the right vision, the right time and the right hunger. There’s no way that PPH won’t become the number 1 freelancing site in the world. Wish you the best mate! Gosh!! I didn’t realise people thought there were any problems. I’m happy with what ever turns up on PPH and I need anything, I just email the support team and within a matter of hours, days or months depending on the nature of my problem, it’s solved. If it ain’t broke – Don’t fix it! I would love to have jobs show at the top, whether they want US writers or only UK writers. I have some UK experience, but, I seldom get a UK writing or editing job and would love to avoid bidding on UK projects as it is sometimes time consuming to no avail. Whilst I might be fully qualified, the buyer probably passes me up in favor of the UK writer. Apart from that name (Xenios) which resemble a big computer brand i am surprised too of receiving your email. And thanks for the opportunity given to us freelancer to get into this well done site. PPH puts us in touch with people who can deliver innovative and interesting products and services. As a small business being able to book services by the hour is fab. We love it.